With eight more days to go in this poetry challenge a sister is running on fumes! Usually if I’m freelancing and not following the prompts, my poems are the first things that come into my mind after I wake up and all I have to do is write them down, but not today folks. I was pressing and forcing the issue and quite frankly what I was coming up with was horrid! I would feel really bad subjecting that kind of writing on you so I thought I’d steal an idea from one of my blogging buddies, Sulekha Rawat, who so creatively wrote a poem using book spines. 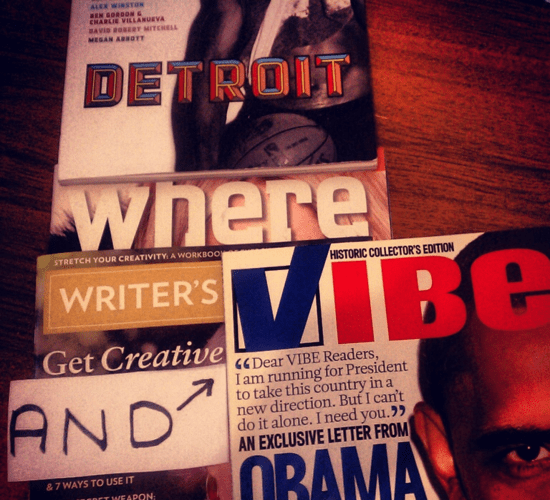 I switched it up and used periodical titles since I am also a magazine fanatic as well as a book lover. Thanks for the idea Sulekha! You saved my hide today girl! Cool…whose idea shall I steal now? Thanks! Janaki, I may be borrowing from someone else too in order to complete this challenge! My brain is fried! LOL! Lol @ the idea stealing! But it’s all good because you all came up with your own unique brands. This was great, Tameka. The titles flowed and you have really cool visual!